The Bulls Friday lost a game, 98-93 to the Denver Nuggets to end their preseason recreation 2-3. But in doing so, and perhaps more importantly, the Bulls may finally have found Jabari Parker. The media wasn't so fortunate as Parker again slipped out without meeting with reporters. But with 19 points on seven of 11 shooting, three of six on threes, six rebounds and fluid ball handling and pace, Parker finally seemed to demonstrate the nobility of his play. The Bulls figure to prefer the show over the tell. "It was great to see Jabari have the type of game that he did on the offensive end," said Bulls coach Fred Hoiberg. "I thought he did a really good job attacking, making simple plays; then his shots started falling. He started the game more in a facilitating role, and then really got it going with the shots. It was great to see." 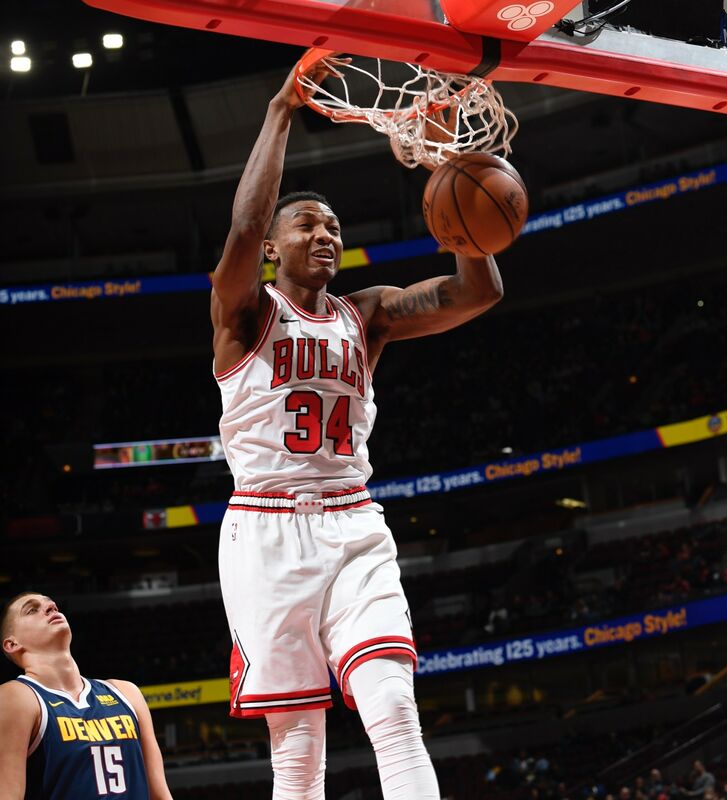 It was perhaps more of a relief for the Bulls with Parker faltering and being moved back to the reserve unit, seemingly not liking that so much, and needing a ladder most times to get close to the rim. Parker was shooting 26 percent overall and 20 percent on threes the first four games. 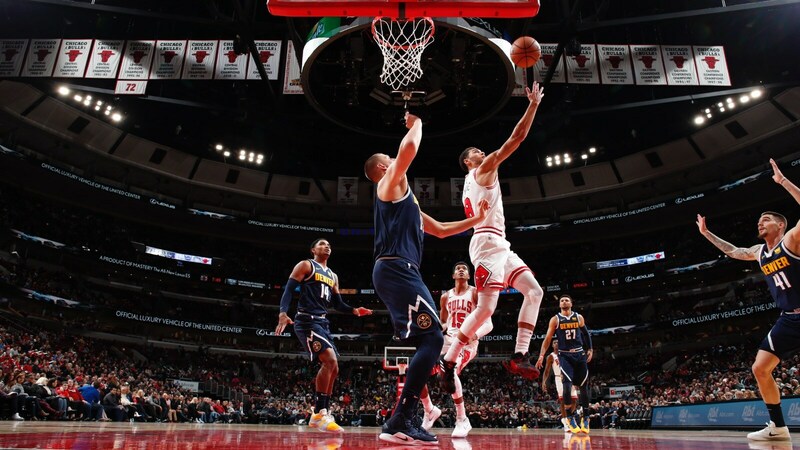 He's never going to be an electric athlete, but Friday he helped lead the Bulls back from a 17-point deficit as the only Bulls player with a double digit plus rating on the court. Zach LaVine had 12 points on five of eight shooting and sat out the second half to rest. Justin Holiday, Bobby Portis, Wendell Carter Jr. and Cameron Payne each had 10 points. Carter led with nine rebounds, four offensive. Cristiano Felicio had three blocks in six minutes. But Dunn had six turnovers and LaVine four, the Bulls with 14 of their 19 in the first half to fall behind by 12. Parker, meanwhile, was in the midst of several highlight plays, leading a classic three-man break with Dunn and LaVine, and after the Bulls fell behind in the third quarter by 17 points, scoring eight consecutive points with a pair of threes and adding another with four minutes left to bring the Bulls within 88-87. The Nuggets then scored five straight to assure their victory. But LaVine had long been out of the game while Parker was trying to rally a group that included Felicio, Payne and Chandler Hutchison. It would not be, but it also would not matter much with Parker showing the kind of spirit and strength missing most of preseason. "It was great to see Jabari have the type of game that he did on the offensive end. He started the game more in a facilitating role, and then really got it going with the shots." "Jabari is so skilled offensively. They put him in a couple of different roles and it's tough," sympathized LaVine. "I remember me coming back. I was having some up and down games. He's coming on a new team, playing a new position; people have to understand that, got to give him time and that's what we are trying to do. In the second unit or starting, he's able to facilitate. He's a willing passer, he understands the game, especially when someone has it going. He's been in the huddle a couple of times where the coach called a play him and he was, ‘No, let's get the ball to him and him.' That shows as a teammate someone willing to be unselfish, who can facilitate and get to the hole and create; he's really good." And he's likely to remain in that reserved role as much as Parker seems to prefer otherwise. It seems best for the team considering in a group with Robin Lopez, Payne, Antonio Blakeney and perhaps Hutchison, Parker can be more of a primary ballhandler and decision maker. Parker from his days as a Chicago prep superstar was known more for his intelligence, floor play and skill. He seems better and more engaged making plays rather than being a receiver. With the starters, he tends to have to defer to Dunn and LaVine, or compete with them. Although that starting group stumbled late in the first quarter with a glut of turnovers, the athletic fit seems much better with Wendell Carter Jr. starting at center and Bobby Portis at power forward. They've generally defended eagerly and played with a spirit that was missing in the road losses last week. "I think we are in a much better place than we were a week ago," Hoiberg agreed. "I liked our mentality these last couple of games, especially from a defensive standpoint. If you take away the first quarter, we gave them 33 (because of the turnovers), but then held them to under 25 the last three quarters. A lot of that had to do with us going out and playing with great effort, intensity." Hoiberg insisted he truly did not know the starting lineup for the opening game Thursday in Philadelphia. The NBA regular season opens Tuesday. The Bulls home opener is Oct. 20 against Detroit. Hoiberg has continued to urge effort and energy, both of which seemed more apparent with the starting lineup of the last two games. Given Hoiberg's comments on preferring the style of play of the last two games, it seems almost certain the same five will open in Philadelphia. Injured Lauri Markkanen remains out well into November and Denzel Valentine also seems unlikely for the opener with his sprained ankle. The Bulls didn't announce any personnel moves, but it seems likely that Ryan Arcidiacono will have a spot considering he started the second half for LaVine. "The way we are playing on the defensive end, our mentality is a lot better than it was," said Hoiberg. "For us, everything starts with effort and intensity. I've liked our approach in that regard because we are much better on the defensive end than we were a week, 10 days ago." And now they start writing everything down in pen. "Biggest takeaway is probably we can be a really good team if we play together on both ends, compete the way we do offensively," said LaVine, who led the team in preseason scoring with about 18 points in 22 minutes per game. "We have such good athletes, ambitious scorers and weapons that we should be able to put it together defensively. We have to compete every play. We have to prove people wrong; there are a lot of outside opinions on us, so we have to go out there with that mentality."